Our main philosophy is that EVERYTHING SPEAKS. Every single action, word, image or object associated with our business says something about the things that we value. In essence this is our brand. 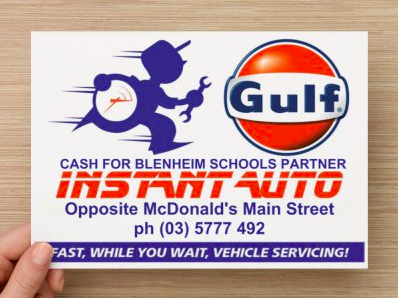 More than ‘Jiffy Stan the Spanner Man’ (our running man logo) or the name Instant Auto, our brand is every touch point that consumers and staff have with our business. It is challenging to maintain at times, however we value a clean workshop, spotless waiting area and clean well structured yard spaces. Even before customers enter our premises the lavender rows and standard roses says that we are different from other workshops. The signage on the road side identifies a clear point of difference in the products we offer and the way we share and communicate with customers shows that we actually do care about what they think. If we care to keep things clean, make sure there is a comfortable space for people to wait and clean up after ourselves it says we take care of the details. If we can be seen to take care of our business then we can be seen to take care of our customers. It is no secret that we have old car parts and waste oil to recycle however customers do not want to see this any more than consumers want to see dead cattle at the supermarket. I believe that customers trust us more for taking care of the details. If we care about our stuff we’ll care about yours. If our brand is every touch point with the business then we need to get our brand out in the community. This can be challenging for a small start up business with limited resources and so marketing is managed carefully. We’re aware that a great business does not provide a vendor consumer relationship but rather builds a community of loyalty and trust. Even after just two years trading we’re constantly receiving positive referrals which is aiding our growth. Success breeds success and that the best way to engage with our customers is to actually... engage with our customers. When a vehicle is serviced with us customers receive care and attention. They are given a small gift that carries our brand (usually stationary) and a card that explains our extra services. It also asks them to comment or review us online. We have visited a number of organisations and strongly support Grey Power. We offer significant discounts for Grey Power members and have a full page advertisement in their annual publication. Customers love that they can come and sit in our waiting room, have free tea or coffee while reading local news or watching television. An online presence is essential to any business. I’m very proud of the fact that we feature well in any search for our services locally. We haven’t been swayed to purchase adwords based on consumer resistance to such. 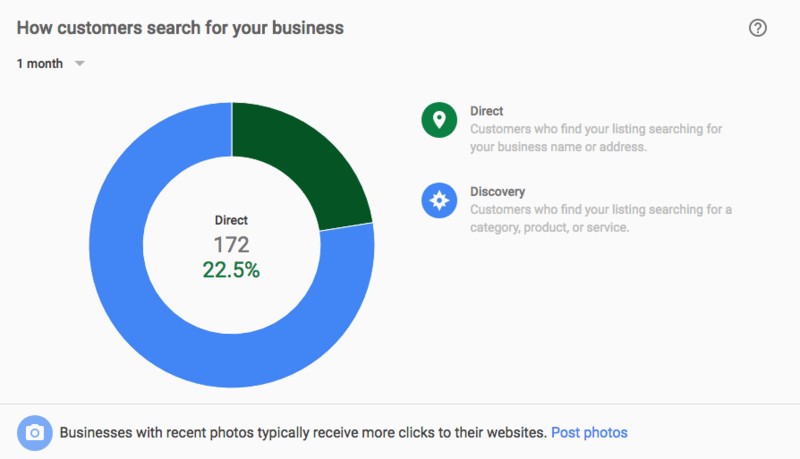 Whenever someone searches our services locally we are always the first organic match, ie after a couple of paid advertisers on google appears Instant Auto. Every time we post or are reviewed it increases our online activity. We are still talking pretty small numbers but in comparison to other local businesses we have the most reviews across Facebook and Google as well as having as many followers as businesses many times larger than us and decades more experience in the local marketplace. This online presence drives business our way. We do especially well with younger and foreign consumers as they navigate their way around the country using their smart phones. Having a website that clearly describes our services, online booking and optimised for smartphones and tablets is essential. We are gradually withdrawing from established advertising media such as print and radio. This is based on cost versus value. As newspapers wind down their traditional operations and listeners turn to products like Spotify and iHeart it makes it hard to consider spending on shrinking readership and listenership groups. At opening we spent a large sum of money on established advertising across nine radio stations as well as local papers. We closely monitor our online traffic through direct logins on our website and Google Analytics; a free app that identifies total and unique visitors to our site. It can tell where the searches have come from which helps us get bang for buck. It’s no secret that the volume of referrals are from Google and then Facebook. It gives us feedback about other search engines. A good example is that we spend nearly $30 a month on Neighbourly and I can see just one referral in July; sorry Fairfax but this is not a good use of our money. Cash for Schools was an initiative adopted by a number of local primary schools in 2015. We used some of our early capital to offer a cash back incentive to locals who nominated the school of their choice at service time. Schools received $200 for registering with us and $5 from each vehicle service went to the school that customers identified. This was a great idea but very hard on our limited resources in our start up months. Schools and community groups are a great way to extend our brand and helps grow loyalty. We currently sponsor academy books in some lower decile schools in town and would like to increase our local support as our business grows. Our pricing is structured to match what we need and to provide real value for customers. We have fast become the best value operation in town. We offer a number of free services to keep people coming back. A good example is our Bronze level service. We check and top up if required all your vehicle oils and other fluids in between regular scheduled servicing. We check tyres and tyre pressures and all we ask in return is that customers carry our brand in the form of a small sticker placed on the right side of the rear window. 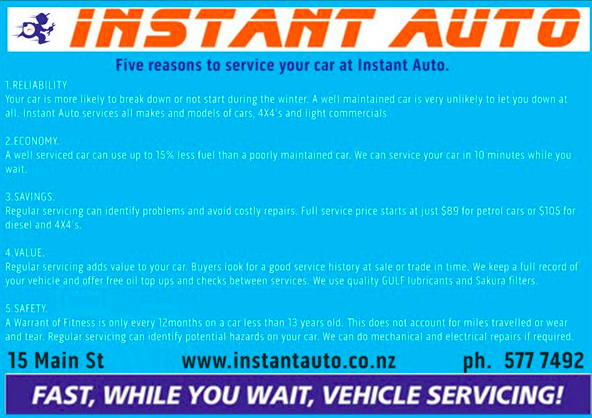 All other servicing is based on our three levels of service and are menu priced. A simple matrix is easy to read and with our help customers can quickly identify the type and price of service their vehicle requires. Other marketing undertaken has been two; whole of Blenheim, mail drops. These were handled by us personally due to the prohibitive cost of flyer distributorship. We advertise across nine radio stations and our current theme of ‘wife knows best’ dialogue is proving popular on the NZ Media and Entertainment stations. We have provided sponsorship for a number of school fundraising and community events. Strategically we have done this by providing product vouchers. Pleasingly in just about every case the customer who has redeemed their vouchers has returned to become a repeat and loyal customer. It is important to not to fill promotions with fish hooks and conditions. Building trust requires that we provide real value. We do what we say and say what we do.